Grab your dehydrater if you have one, if not, go buy one and throw away the receipt so your husband doesn’t find it (I call this destroying the evidence). Or you can use your oven on the lowest setting. Next, grab your cherry tomatoes (I used about 4 pints for this batch) and cut them in half. Artfully arrange them on your dehydrator trays, cut side down. Make sure you leave enough room around the tomatoes so that air can circulate all the way around each tomato for maximum dryage. Placing the tomatoes in a beautiful arrangement. I mean look at it, that should be in a magazine it’s so beautiful. Continue arranging and stacking the trays until you’re out of tomatoes. 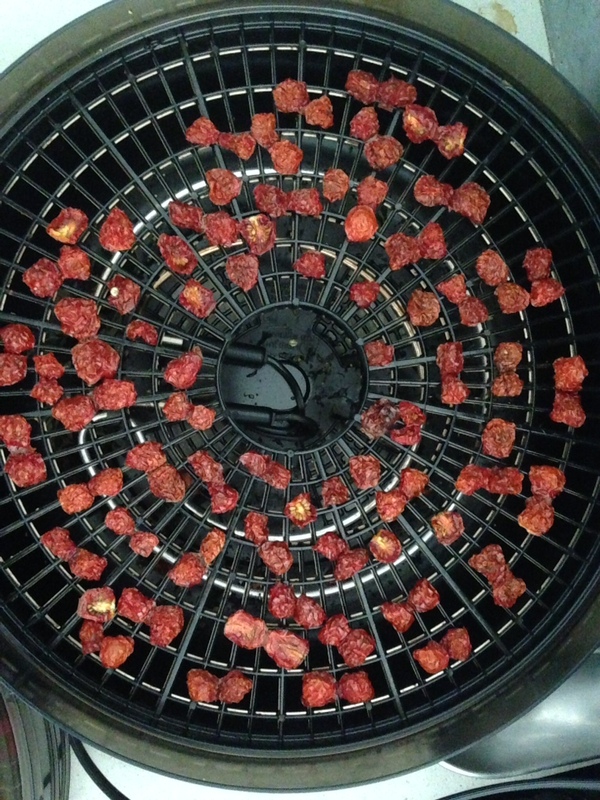 Plug in your dehydrator and wait it out. The amount of time it takes to completely dry the tomatoes depends on how large your tomatoes are, how many you have and how many trays you’re drying. Check back in a few hours. In a few hours, check the lowest tray to see how they’re doing. I like my tomatoes a little more dry than a raisin. No moisture but not brittle and still a little pliable. Mmmm taste fake and bake cherry tomatoes are ready after a few hours in the dehydrator. Now that the lower tray is done, you can do a number of things: put them in a bag, vacuum seal them and throw them in a freezer, eat them like delicious tomato candy or pack them in oil. Today I’ll show you how I store our fake and bake cherry tomatoes in olive oil. This way, not only do you get tasty dried tomatoes for salad, pizzas, pastas and more… but you get flavor infused olive oil for salad dressings and cooking! I start out with a layer of our fake and bakes, then I sprinkle some freshly dehydrated basil from the garden. Then top that off with enough EVOO to cover the layer of dried tomatoes. 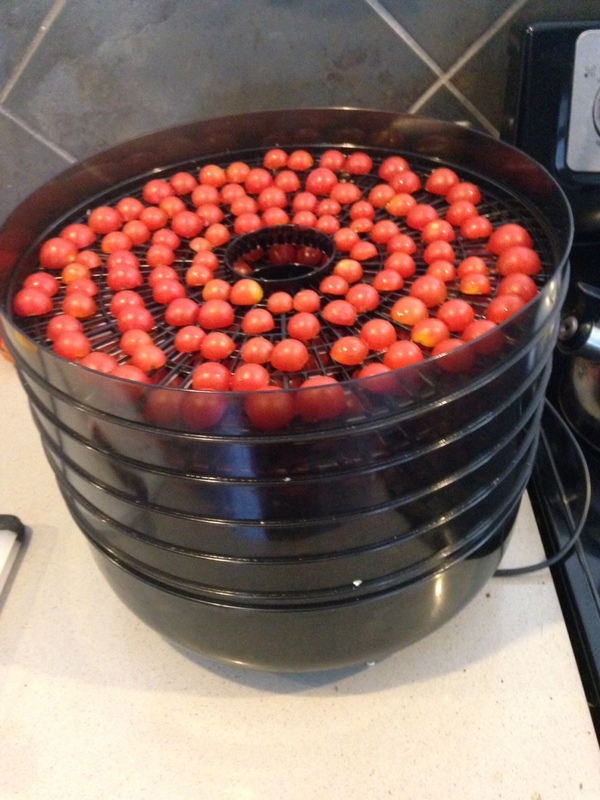 Keep rotating the dehydrator trays and filling your canning jar with tomatoes, seasonings (optional… but nice) and EVOO until you reach the top. When you’re done, throw a lid on it and put it in the fridge. The oil will solidify in the fridge and it will look gross. 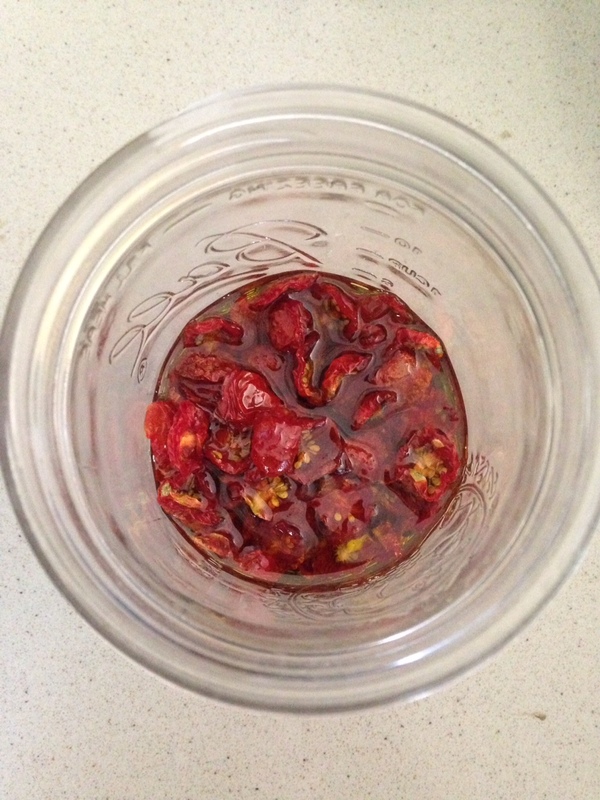 But when you’re ready to use it, take the jar out the fridge, and the oil will liquefy again. And there you have it! 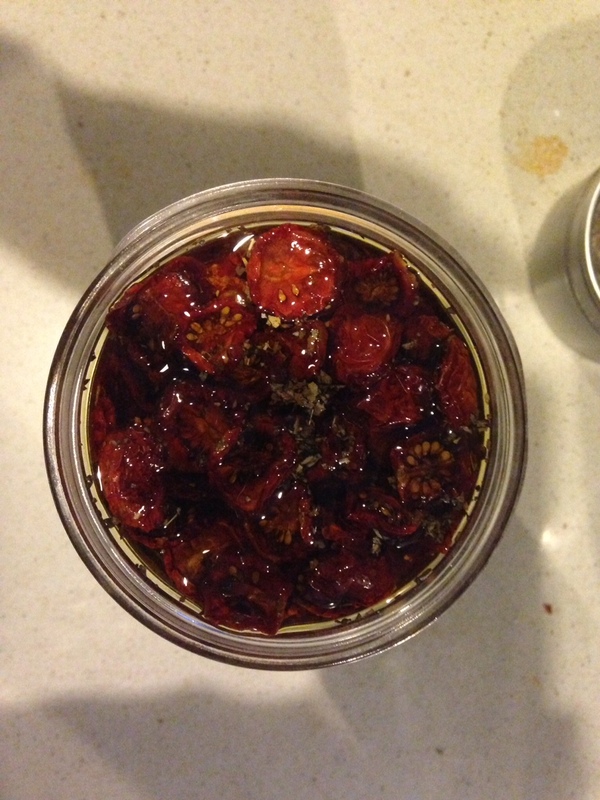 Delicious, tasty fake and bake sun-dried cherry tomato candy goodness! « Oh my… where have we been? Beautiful! What a pretty Christmas present that would make as well. Got me inspired! 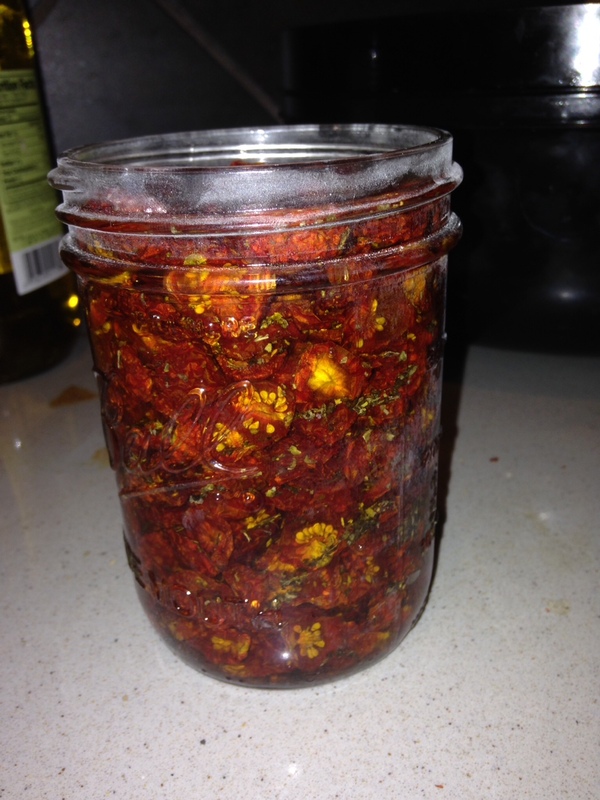 I was thinking about sun dried tomatoes for preserving some tomatoes as well. Thanks for the helpful post. Now I know how to do it!